Over-the-calf diabetic sock to help relieve aches and pains throughout the day. Designed to stay over your calf throughout the day for maximum comfort. The Shape-to-fit Over-the-Calf Sock is designed specifically for diabetes but provides all-day comfort for anyone. The seamless, moisture-wicking over-the-calf sock helps to prevent skin irritation, aches and pains all day long. Built to last up to four times longer than ordinary socks, the Nano bamboo charcoal fibers help control odor and keep feet dry. And because they’re non-binding, they don’t inhibit your circulation. Product Care Machine or hand wash with like colors. Tumble dry low, with low heat. Do not bleach. Our Dr. Comfort sock are designed with Nano Bamboo Charcoal Fibers because of the endless amount of health benefits. It makes our diabetic socks more breathable and heat regulating than cotton, hemp, wool or synthetic fabrics. With thoughtful construction, our diabetic socks are designed to promote circulation in the foot, stay up and offer comfort, ventilation and light arch support. Available in a variety of styles to meet the needs of your lifestyle demands. Diabetes can cause nerve damage and poor circulation that can be hazardous to your feet. Wearing Dr. Comfort’s Over-the-Calf Diabetic Socks helps to promote blood circulation while reducing the moisture and microbial growth that can cause infections. 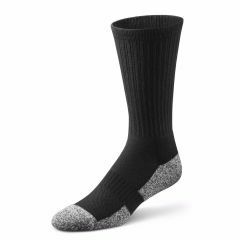 Crew length socks that surround the feet with long-lasting cushioned comfort.